Monitor photo Lt. Gilbert Zamora is sworn as the new police chief by Mayor Pro-Tem Joel Garcia after having served as the interim chief since April 2018. PALMVIEW — Two interim city positions will now be filled permanently after the Palmview City Council voted to hire a new city manager and police chief. After running the city for almost two years, interim City Manager Leo Olivares will hand over the reins to Michael Leo, the director of economic development for Hidalgo County, who — during a Tuesday council meeting — was hired for the permanent position effective Jan. 1, 2019. Leo, who will finish out the year with the county, said he was drawn to the role because he is from the community and was already involved with the city through its Municipal Development District. An MDD, like an Economic Development Corporation, is meant to foster economic growth within a city. His background in economic development would be instrumental in that, especially as the city hopes to attract more businesses once the project to bring sewer services to the city is finally complete. Olivares, who will remain with the city through the end of the year to help with the transition, has been the interim city manager since April 2017 after then-City Manager Ramon Segovia was placed on administrative leave and later terminated in June 2017. 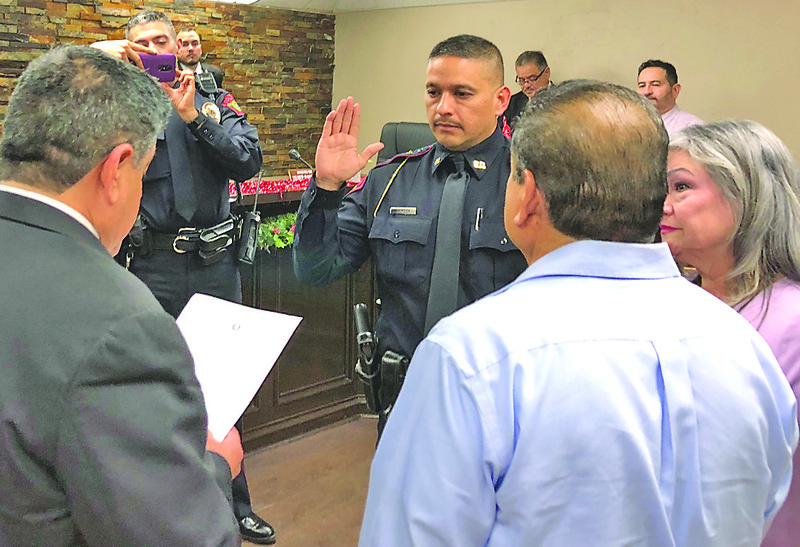 During his time with the city, Olivares oversaw the hiring of a finance director, a new city secretary, and on Tuesday, the hiring of a new police chief. Olivares recommended the hiring of Lt. Gilbert Zamora, who has served as interim chief since the termination of Christopher Barrera in April 2018, as the permanent chief which the council unanimously approved. The city also hired a new city attorney in Eric Flores, a Palmview native who has spent seven years with the armed forces and is currently a commander within the Army National Guard. Flores replaces Gus Acevedo as the city attorney, whose resignation was effective that day. The slew of hires followed a transition within the city council as a result of the November municipal elections. Former Councilman Ricardo “Rick” Villarreal was sworn in as the new mayor after running unopposed in the elections. Former Mayor Gerardo “Jerry” Perez decided against running for re-election. Also sworn in were council members Jose Luis Perez and Anthony Uresti, who ran together on the same political slate during the elections. Perez defeated incumbent Joselito “Hoss” Hernandez for the Place 2 post, while Uresti defeated Hernandez’s running mate, Arturo “Art” Alaniz, for Place 4. That Place 4 seat was vacated by Villarreal in August after announcing his intention to run for mayor.